Highlights from 2017 are strong registration growth by several EU countries, an increase in DNSSEC signed domain names, and important achievements throughout the year, including winning the CENTR Registry of the Year Award. BRUSSELS--(BUSINESS WIRE)--EURid released its Annual Report today, which contains an overview of statistics, achievements, and financials from 2017. Compared to 2016, total, net registrations grew by 52 085 (from 3 762 970 to 3 815 055), the average renewal rate rose by 2.5% (from 79.4% to 81.9%) and DNSSEC signed domain names grew by 95 199 (from 348 401 to 443 600). With EURid’s expanding efforts towards building a trustworthy and secure online space came a rise in communication activities surrounding domain name security and DNSSEC, which played a role in the increase of DNSSEC signed domain names. The countries that saw the most growth in terms of registrations were Austria, Bulgaria, Iceland, Liechtenstein, and Portugal. Portugal and Bulgaria were also top growth countries in 2016. Achievements throughout the year included highlights like the addition of WIPO as an Alternative Dispute Resolution provider, the Ugandan borehole rehabilitation project to compensate for CO2 emissions generated 2016, receiving the CENTR registry of the year award, and the development of a domain name abuse prevention tool. Financially speaking, EURid saw a decrease in costs throughout the year (- 1.66%), in addition to a decrease in revenues (- 6.08%). This has a correlation with the total registration growth that occurred during the year. The dip in total revenue in 2017 was namely due to a change to the registrar reduction schemes. While on the one hand it generated a dip in revenues, it also resulted in more people registering the .eu extensions. Learn more in EURid’s 2017 annual report. EURid is the non-profit organisation that operates the .eu and .ею TLDs, following a tender process and appointment by the European Commission. EURid works with over 700 accredited registrars and provides support in the 24 official EU languages. As part of its ongoing commitment to data security, EURid has been certified for the ISO27001 security standard since 2013. EURid is also registered by the EU Eco-Management and Audit Scheme (EMAS), which is an expression of its environmental commitment. More information at: www.eurid.eu. 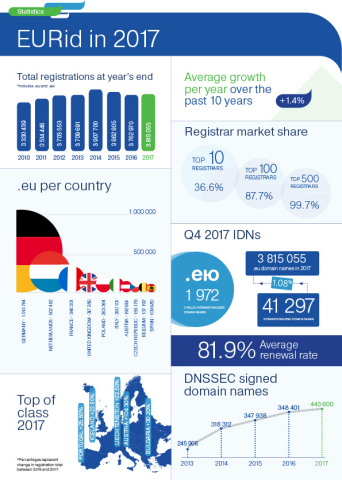 EURid's 2017 annual report shows positive growth for the .eu extension and an increase in DNSSEC signed domain names.